When grape tomatoes are overflowing in your garden, whip up a quick, easy tomato sauce! 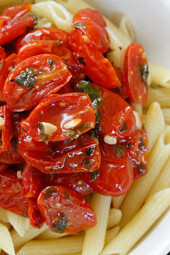 Grape or cherry tomatoes sauteed with olive oil, garlic and fresh herbs are perfect over pasta, grilled chicken or fish. Take advantage of summer tomatoes now while they are at their peak! I also have an Oven Roasted Tomato Sauce, perfect if you have ripe summer plum tomatoes. 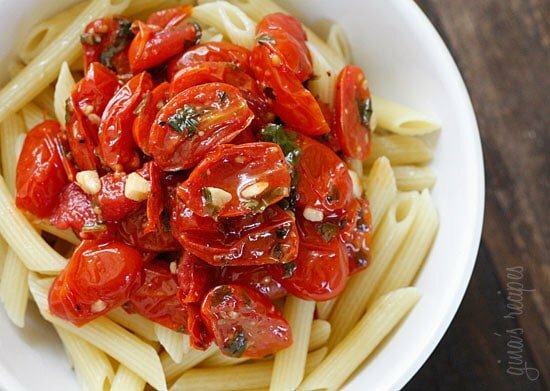 This recipe is from the archives from last summer, I’ve been making it quite often these past few weeks now that grape tomatoes are at their peak so I decided to bring this recipe forward. Perfect over your favorite pasta shape for meatless Mondays in less than 30 minutes. Meat lovers can add chicken or shrimp for a spectacular summer pasta dish! And for a spectacular way to prepare fish, try this simple fish dish with summer tomato sauce. In a large non-stick pan, heat oil on high heat. Add tomatoes, salt, crushed red pepper flakes and fresh black pepper and reduce heat to low. Add fresh oregano and cook another 15 minutes. *Nutritional info does not include pasta.